The Afrikaans Language Monument, Paarl. 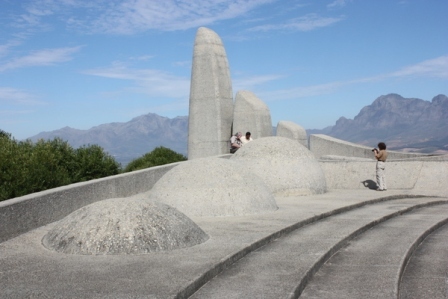 The Afrikaans Language Monument (Afrikaans: Afrikaanse Taalmonument) is located on a hill overlooking Paarl with its outline visible from a considerable distance. This is the only language monument in the world and was completed in 1975. The design represents the growth and developement of Afrikaans and recognises its roots which is spread over three continents - Africa, Asia and Europe. 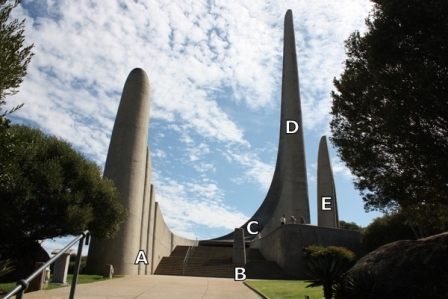 A: The three colums on the left that are close together represents the influences of the three Western languages on Afrikaans - Dutch, French and English. B: The wall on the steps represents the Malayan language and culture. C: Architect Jan van Wijk was inspired by words of prominent Afrikaans authors N.P. van Wyk Louw and C.J. Langenhoven. The "roof" refers to Van Wyk Louw's words: "Afrikaans is the language that connects Western Europe and Africa... It forms a bridge between the large, shining West and the magical Africa..."
D: The main column which is 57 m high, represents the growth, evolution and achievement of Afrikaans and was inspired by a quote from Langenhoven: "If we plant a row of poles down this hall now, ten poles, to represent the last ten years, and on each pole we make a mark at a height from the floor corresponding to the relative written use of Afrikaans in the respective year, and we draw a line, from the first here near the floor to the last over there against the loft, then the line would describe a rapidly rising arc..."
E: The last column symbolises the Republic of South Africa which was the birthplace of Afrikaans. On the photo below, the three round shapes symbolises the contribution of the African languages - Xhosa, Zulu and Sotho. With all the steps and lawns, children will enjoy all the freedom to run and climb. 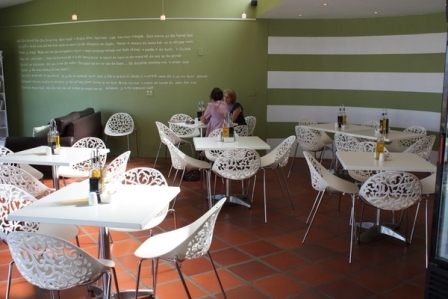 At the Volksmond Coffee Shop you can enjoy light snacks or you can browse the curio shop. The amphitheatre, just below the Afrikaans Language Monument, is the venue for full moon picnics and various shows. If you want to understand the South African culture, it will be worthwhile visiting the monument. 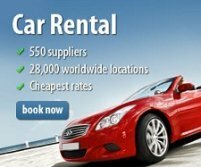 It is an nice drive there and the view is great. Moet jy die Afrikaanse Taalmonument gaan besoek? Natuurlik! As jy hierdie stukkie kan lees, dan moet Afrikaans jou na aan die hart lê. Hoe kan jy die taal waardeer en geniet as jy nie sy herkoms ken nie? Klein kinders sal ook die besoek geniet, want hulle kan hardloop, klim en spring! Return from Afrikaans Language Monument page to Homepage.